All Products > "58427 Tamiya 1/10 Fiat 500 M-05"
1957 saw Italian car manufacturers Fiat release the first Nuova 500 which went on to be a very popular little car. 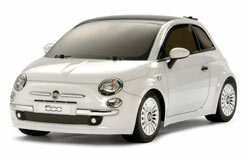 50 years later in 2007, Fiat has enjoyed amazing success with their modern interpretation of the vehicle, the Fiat 500. The Fiat 500 was enthusiastically received by the consumer market not only in Italy but worldwide with the first production lot selling out within 3 weeks. • The Fiat 500's body is accurately reproduced with a vacuum formed polycarbonate shell. • New parts for side mirrors and wheels. • Type 540 motor is installed on the excellent M-03M Chassis. • Front mounted motor; 2WD front wheel drive. • Tread pattern rubber tires with inner sponge included. • 4-wheel independent double-wishbone suspension with friction dampers provides excellent handling. • Battery pack & charger and 2-channel R/C system separately required.